Steve Heimoff tastes 5000 wines a year–professionally. He’s also controversial when it comes to wine bloggers. In his keynote, which I am enjoying with some AUS shiraz samples of the tasty Mollydooker The Boxer and the absolutely juicy joy of Carnival of Love, he starts out with discussing how this is a transitional phase of wine writing from the era of “ivory tower” wine writers to a more democratized wine writing via Robert Parker who wanted to write in a way to make wine more popular and wine writing more available to the level of the average person. Now he points out it’s the third wave of wine writing where women are now writing about wine. The top down model of wine writing has changed radically with the spread of social media so that now there are thousands of wine writers publishing on the web using various social media platforms–primarily blogs. He sees how blogs provide writers an opportunity to write in a stronger more personal voice. Having a blog allowed him to write without the chafing of the yoke of an editor. Before he started blogging, he looked around and saw a lot of bad writing online. While he wasn’t sure what his “voice” was going to be, he did know he needed to post every day by 9am. He decided he wasn’t going to review wine, give it scores, or in otherwise compete with established print journalism. And he kept monitoring the blogging scene. When he observed a LOT of bloggers writing glowing reviews of a particular wine (a Rodney Strong sauv blanc), he figured out that a publicist had sent out samples to bloggers instead of traditional media. What bothered him the most was that the publicist has required them to write about the wine in exchange for receiving it. Was the publicist manipulating bloggers for free media? And what it taught him was about transparency and the type of transparency demanded by the online community because of the nature of the ability to comment immediately and interact not only with the author but with each other. That was in 2008. That’s the past. And because of the nature of the internet, you can find all of it online if you want to see it for yourself. That was the past. What’s the future look like? Wine publications aren’t dying out. More and more people “live” online. Bloggers are building brands. Per capita wine consumption is increases. Consumers value the opinions of “tastemakers” to decipher the infamous wall of wine. All of which bodes well for the future of wine writing no matter wheer it is being published. So in the future will various industry elements be as obsessed on “authority” or other parameters? Who are the new super stars who will influence? How could a Gary Vaynerchuk be repeated? How can a wine blog support a family? Pay a mortgage? How can wine bloggers blog indefinitely if there’s not money in it? Will subscription model work–no matter how much someone likes it when it’s free? People always will look for some sort of expert advice when it comes to buying cars, products, wine. Money will flow to where there’s demand. Where there’s a need. 1. Don’t get manipulated by wineries. 2. You will need to have a paycheck. That means a boss. That means someone telling you what to do. 3. You need to have a thick skin. 4. Find your voice. That’s why people will read you. Because your writing turns them on. 5. Have a vision and follow it. Formulate goals and go for it. 6. Recognize that you’re part of a tradition. Just because wine writing is going digital, doesn’t mean you’re not part of a tradition. Who will be tomorrow’s successful wine writers? And how to get there? How to develop your palate? 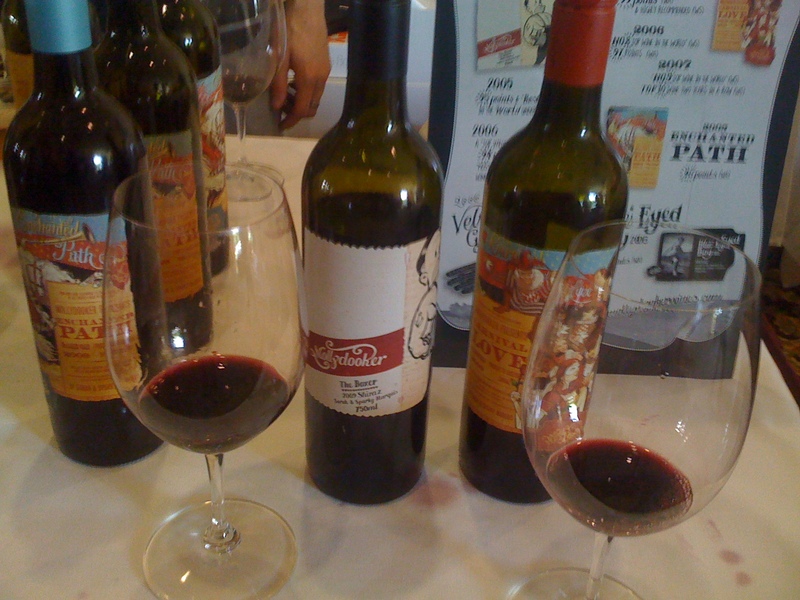 Oh and really this Mollydooker Carnival of Joy shiraz is one of the best wines I’ve tasted in three days of tasting. I love it. And if I get another minute, I’ll try to find the words about why beyond it’s like blueberry delight, with some richness and lots of joy. It’s a juicy love story if I’ve ever had one. I’ve been a big fan of AUS shiraz ever since I discovered the Grateful Palate warehouse sales when the warehouse was near my house. What a pleasure to try so many of your wines! I also loved the Velvet Hand but Carnival of Love might be my favorite–I didn’t get a chance to try them side by side to compare. There was lots of amazing wines but the Carnival of Love is one fo them that really stuck to my palate and my pate!